There are enough local shops in Duck to keep you busy for days. You will find everything from fine art to toy stores in the town. Just south of Corolla, the town of Duck was named for its abundance of waterfowl which both migrate through and call the area home. Ducks, geese, saltwater shorebirds, pelicans and herons are just a few of the locals that inhabit the small town; while walking and biking trails abound, encouraging guests to take advantage of the many wildlife viewing opportunities. The Town Park and the 0.62-mile boardwalk are new additions that further encourage locals and visitors to get out and enjoy beautiful sunsets, art, music, shopping, water sports, dining, group exercise and various town-sponsored events. During the summer and fall seasons, Duck hosts a series of local events that draw in visitors year after year; from the annual 4th of July parade to the Duck Jazz Festival, there is always something to see or take part in while vacationing in this coastal community. 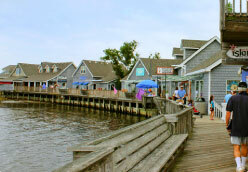 In addition to the town's draw, the beaches of Duck are the most pet-friendly along the Outer Banks and are private to only those staying in the town; and with its proximity to Corolla and Kitty Hawk, day trips to different areas on the Outer Banks are easily accessible from your Duck rental home. Sun Realty is proud to represent vacation homes in the town of Duck and the properties offered by Sun Realty range in size from comfortable condominiums to elaborate, seven and eight-bedroom rentals in this area. We also offer the largest inventory of pet-friendly accommodations and can easily house both you and your pet for your OBX vacation.